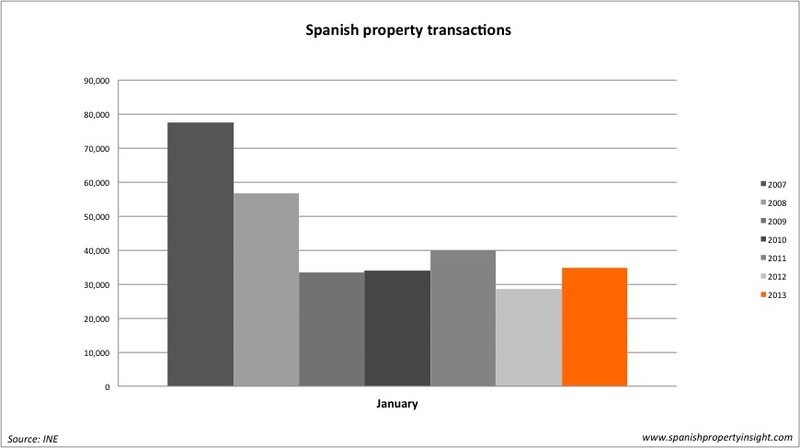 As to be expected, the registration of Spanish home sales leapt 22pc in January, as buyers rushed to complete before mortgage tax credits disappeared. There were 34,831 home sales registered in January (excluding social housing), an increase of 22pc on the same month last year, according to the latest figures from the National Institute of Satistics (INE). Home sales are registered in the property register a couple of months after completion, so these figures represent sales that took place at the end of 2012, before mortgage tax credits for buyers disappeared at the start of this year. So really, the 22pc rise in January should not be interpreted as the first signs of a market recovery. It just reflects the fact that many buyers brought forward their purchase to take advantage of tax breaks that have now gone. As a result, we can expect registered sales to slump in the next few months. Right on cue, house sales figures from the Notaries Association show a decline in completions of 26.8pc in January, to the lowest figure on record (see chart below), and this will soon show up in the registered house sales figures published by the INE. 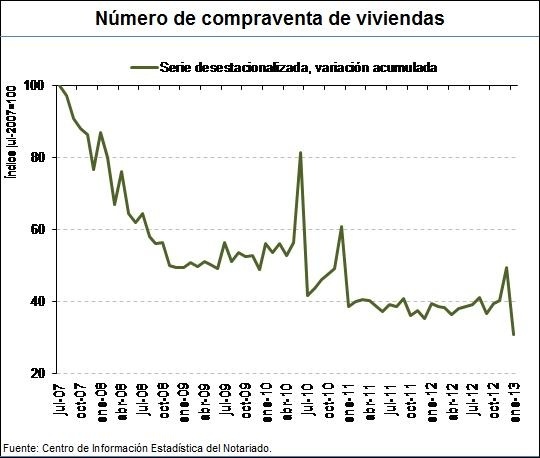 The Notaries’ figures show that the increase in registered sales in January was just an illusion. It remains to be seen what impact the abolition of mortgage tax relief and higher VAT rates on new homes will have on the market this year. By raising transaction costs, you would expect fewer sales this year compared to last year. However, house prices are falling, which should compensate for higher transaction costs. House prices will have to fall at least as much as transaction costs have risen, if not more. My forecast for the year is a stable number of transactions, roughly in line with 2012, perhaps even a bit higher. I think the market has found a floor around 20,000 sales / month. I don’t expect a recovery in sales until next year.